September 27, 2018 - New Yorker Electronics has announced its recent joint enterprise with Panduit, a leading global provider of electrical and network infrastructure solutions, to provide advanced end-to-end network systems and components to end users. Panduit is a world-class developer and provider of leading-edge solutions that connect, manage and automate the physical infrastructure of business systems. 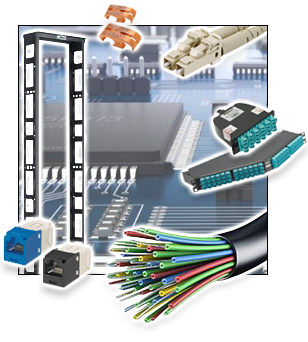 Nearly every portion of a company’s electrical and computer linkage is available through Panduit – including hardware and software, cable bundling, racks and cabinets, copper systems, thermal management, wire routing, fiber systems and more. Panduit offers everything to bundle, protect, connect, route and identify new or existing installations of integrated circuitry. This ideal pairing between Panduit and New Yorker Electronics, a global electronic components distributor for over 70 years, means even more complete solutions for data centers, enterprise, industrial automation, OEMs, MROs and industrial construction companies. The partnership will enable a more complete availability of supplies for connectivity and bandwidth, allowing businesses access to a single source for end-to-end networking infrastructure. New Yorker Electronics is a reliable source of passive components known for its full product lines, large inventories and competitive pricing. “There is a real, tangible advantage to end-users. Like Panduit, our passive electrical components are similarly found throughout networks and digital infrastructure,” said Barry Slivka, President of New Yorker Electronics. "Now, we are able to offer customers complete solutions through a single distributor. This means Panduit products are now available with the personalized service and turnaround that the giant distributors cannot offer. Panduit brings data centers, industrial automation facilities and similar companies a more flexible way to enable software and systems to communicate, both within the company and throughout the world. Similarly, New Yorker Electronics provides passive components for microprocessors and data systems to ensure reliable networking. Together, Panduit and New Yorker Electronics can deliver comprehensive solutions that unify the physical infrastructure to help customers achieve operational consistency. This relationship provides Panduit with an established international distribution channel and robust eCommerce operation. For New Yorker Electronics, it means a very valuable extension to its current offerings of passive components. Customers will benefit from extraordinary ease of access to Panduit’s vast product lines with the experience and responsiveness customers have come to expect from New Yorker Electronics through three generations. New Yorker Electronics is a franchise distributor of Panduit and supplies its full line of cable and wire bundling solutions, copper systems, grounding, wire routing, wire termination, manual and pneumatic hand tools and software solutions such as DCIM. Panduit products are available through the New Yorker Electronics Web site for sale and RFQ.